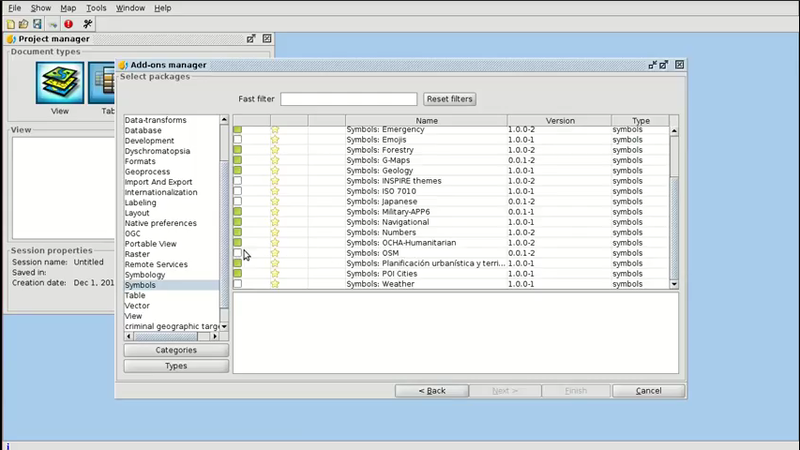 The video of the sixth module is now available, in which we are going to talk about the Add-ons manager. Each version of gvSIG carries a large number of extensions and symbol libraries that are not installed by default in order to avoid overloading the application. The user can choose when to install them, and the Add-ons Manager can be used for that. Besides, if a new gvSIG extension or symbol library is published after the final version release, it is not necessary to wait for the next version to be able to use them. With the Add-ons Manager we have the possibility to connect to the server and install them. Also, if an error has been fixed after releasing a final version, the plugin can be updated without having to release a full version. Standard installation: Plugins included in the installation package that has been downloaded but not installed by default. Installation from file: When we download the extension package, script or symbol library on our disk. It’s very useful when we create a symbol library and we want to share it with the rest of users of our organization. Installation from URL: Available plugins on the server. It is normally used for packages published after a final version, either new functionalities or to fix an error detected after publishing the final version. In this module it won’t be necessary to download any cartography previously. This entry was posted in english, gvSIG Desktop, training and tagged Add-ons manager, city council, municipality management, plugins, symbology. Bookmark the permalink.